Can anyone ever remember the zillions of errands and far-away deadlines that our lives bring?! Don't ever miss another deadline! 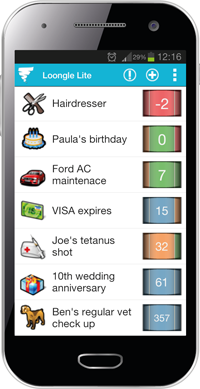 Are you tired of keeping tons of errands and schedules in mind? Fed up with managing things last minute? Or missing deadlines? Loongle is here to take the burden off your mind! Make your life a little simpler. Try Loongle.